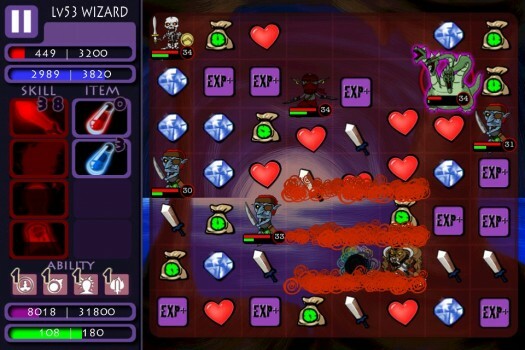 I talked recently about my passion for the puzzle/RPG hybrid in our review of Wizschool ($1.99) (which, incidentally, I liked quite a bit), so when I spotted Puzzle Dungeons (Free) on the App Store only a few days later, I was pretty surprised to see another title that falls into this genre pop up so quickly. At a glance, I wasn’t so sure what to expect, since the title screen was super simple and the gameplay screens weren’t immediately appealing. Luckily I gave it a chance, and I’m glad I did, because it brought a few new things to the table that I had never experienced before in this type of game. 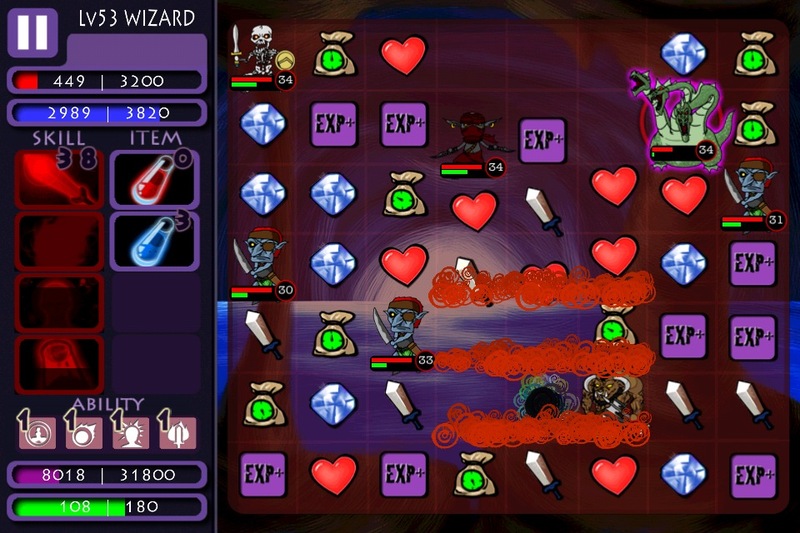 Really, Puzzle Dungeons is less RPG and more puzzle. When you start out, you can choose to be one of three different classes: a paladin, a wizard, and an alchemist. Which race you pick will affect the types of spells you have at your disposal while playing. After you choose your class, you’ll get a gander at the map, which presents a total of 60 levels divided into three categories (Forest of Novice, Hell Gate, and Adventurer’s Cave). This doesn’t mean you’ll actually play 60 separate levels, but that as long as your character level falls into a certain range that’s the area you’ll be playing in. Once you get to the end of an “area," you’ll fight a boss before you can proceed to the next. When the actual play board pops up, it’ll look familiar to you if you have ever played a game like this in the past. On the left, you’ll see all your stats, skills, items, and health. 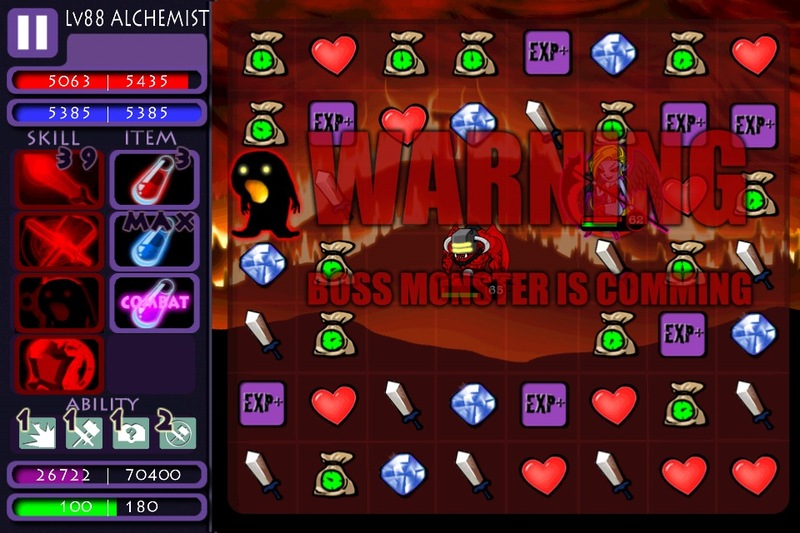 The game itself is classic match three, but instead of having random items to match, you’ll have resources. 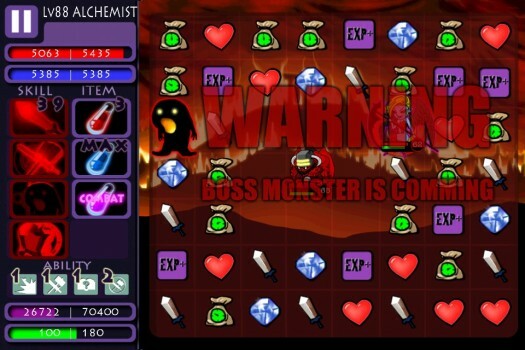 There are blocks for experience, hearts for health, swords to power up your attack, gems for magic, and enemies. This is a really clever way to approach the formula, because you have to watch carefully to make sure you are matching the things you need in order to stay alive. Also, since your opponents also fall into the game grid, you have to keep a close eye out for them to make sure they don’t start hacking away at your life while you’re busy doing something else. The overall vibe it creates is challenging and keeps you moving, which I really liked. 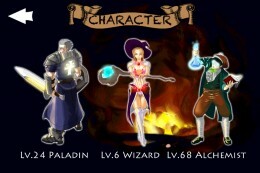 Each class has its own special attributes, meaning you can pull out some cool special attacks as you progress and level up. The alchemist actually has one spell where you can summon a beastie to the board who will periodically slam the ground with his oversized arms, hurting all the enemies around him in the process. You’ll periodically see treasure chests fall into the mix too, which can give you some nice little boosts as you move along. The gameplay is endless, so you just keep playing and leveling your character until you’re killed or you’ve had enough. It’s easy to pick up where you left off at anytime. There’s not much story to Puzzle Dungeons (or for that matter, any at all), but it certainly doesn’t keep the game from being fun. I found some of the art underwhelming, but thats easily forgotten once you get into it. One thing I did notice is that it has no Facebook, Twitter, or Game Center connectivity, which was a bit of a surprise since so many games do these days. On the other hand, I could care less about sharing that type of thing, so it didn’t really phase me much personally. As much as I liked Puzzle Dungeons, I can’t help but wonder what it would have been like if it had been fleshed out a little more. The core is solid and can be a good time, but I think some story and the ability to share could have taken a good game and made it great.